This is a children’s book about the important lessons that can be learned from free play. Jamie is a new boy in a preschool class. He likes to try everything. The kids are not sure if he is a boy or a girl since he sees no gender in the toys or whom he plays with in the class. As the days pass, the other students started playing with all types of toys and kids they hadn’t played with before during free play. They also begin conflict and problem solving. There are instructions for different uses of this story at the end of the book. I enjoyed the bright colored active drawings that illustrate the book. This is a book to help parents and service providers to understand and help the child with sensory processing disorder. I did not understand this disorder and how it affected the child until I read this book. It is very reader friendly. I learned that it manifests itself in behavior that causes distress to the child and people near him. There are wonderful and easy activities in this book to help the child learn to cope with his environment. I especially liked learning math facts while doing jumping jacks. I am excited about this book and hope you will be too. This is a book for teachers, service providers and parents, who enjoy following research in how our brains work to help us learn. There are many strategies that help the students engage their right brains. One of the questions asked of the authors is are boys more visual-spatial learners than girls? You need to find out by reading that chapter. The content of the book addresses strategies for timed tests, handwriting skills, spelling and organization. These students excel in being imaginative, having the correct answer but not knowing how they got it, and being talented artists and puzzle solvers. The teacher readers will find the strategies are easily used with the whole class. Every class has some of this type of learner so check this book out. School Success for Kids with High-Functioning Autism, by Stephan Silverman, PhD, Lauren Kenworthy, PhD, & Rich Weinfeld. Temple Grandin, writes the foreword and sets the themes of the book that follows. The authors refer to the high-functioning autism spectrum disorder and HFASD throughout this book. Its target audience is parents of HFASD children and their teachers. It is easy to read and supported by charts, checklists, worksheets, bibliography, table of contents. The Contents define what will be found in each chapter. So you can read the chapters as needed for your child. There are strategies given for working with your child’s teachers, supportive classroom techniques, working with schools and activities that can be done in your home. Psychologists and social workers, this book’s for you. 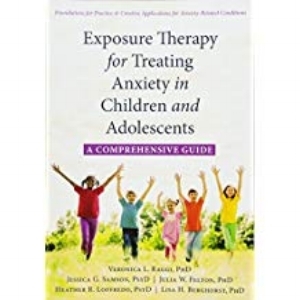 It is comprehensive in its approach to Exposure Therapy, removing it from CBT ( cognitive behavior therapy) explaining how to use it as its own therapy. You can learn how to develop a therapy program and how to adapt it to these conditions: child anxiety, parental involvement, panic disorder, school phobia, selective mutism, social phobia, obsessive-compulsive disorder and emotion tolerance, plus more. The reader finds references, author biographies, comprehensive contents and an excellent index. Transition eventually comes to each of our children. The reader whether teacher, counselor or parent will find this a useful resource. The transition addressed here is leaving high school for work or college, emphasizing how to get to and find success in college. I find this an excellent resource that starts with the laws, rights and responsibilities, self-advocacy, family coaches, finding the right college and requesting any needed accommodations. It includes a comprehensive Table of Contents, References for further information, Appendices with useful information and an Index. Again it is user friendly with clear printing, notes of explanation in the margins. If you are facing transition issues and want to go to college, this is a good resource.